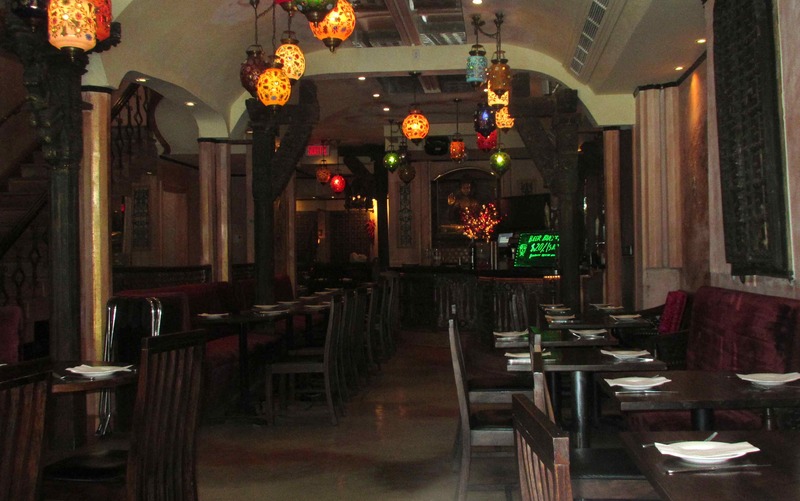 Devi is quite a bit larger and roomier than it looks from the outside and its high ceilings make the simply appointed dining area look almost cavernous. The main floor would seat at least 60 to 80 and I saw that there is an upstairs to the place as well. I didn’t actually go up and look but the restaurant sign advertises a ‘Bar-Lounge’ and I rather think that bit of the operation may be located on the second floor. I arrived on a Wednesday just before the lunch rush and, at my request, I was given a nice little table in the window alcove overlooking the street. Aside from some globular and brightly-colored light fittings, the décor is quite understated and plain but it is clean, comfortable, and, despite the aforementioned ‘cavernous’ appearance, actually quite cozy. I was seated very quickly but thereafter the service was just a little sluggish. As it happened, however, the place filled up quite quickly after I arrived and there were only two waiters in evidence so they were each kept quite busy. Both of them served me during my visit and each was polite, helpful and friendly. What attracted me to Devi (as well as to my first choice of Indian restaurant) was the extensive selection of appetizers. I love meals where you can ‘graze’ your way through a variety of dishes and so this feature of the menu certainly appealed to me. Most of the selections were recognizable but Devi also does a bit of ‘fusion’ cookery and has come up with a few novelties such as the “Manchurian Cauliflower’, which I would have tried had all my other selections not proved so filling. Pappadums – This introductory dish was actually complimentary and was something of an unexpected bonus even though I have been served with free pappadums at other Indian restaurants in the past. These ones, however, were grilled rather than being deep-fried (which was a definite improvement over the standard), and they were rolled into attractive cones before being cooked. 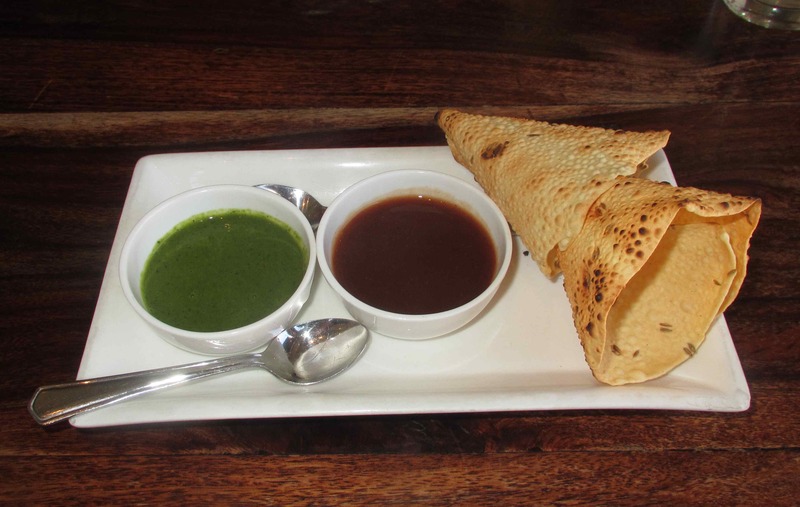 They came with two dipping sauces, a brown, sweet and sour type made with tamarind that I very much enjoyed, and a green one that I thought had been made with mint when I first saw it but which turned out to be a coriander (cilantro) preparation. I am sure this was as well made as the tamarind type but, sadly, I loathe cilantro and didn’t enjoy it. Rating: 4 out of 5. Mint Paratha – This bread choice was huge and I might have decided against it had I known about the pappadum before I ordered it. It was very good, however and was properly flaked and layered but still nicely chewy at the same time. There were also plain and potato varieties available and I think I may have preferred one of those instead as the mint, which sounded interesting, just didn’t work for me all that much. Still, the preparation was better than my own versions at home and I thought they were excellent. Rating: 4 out of 5. 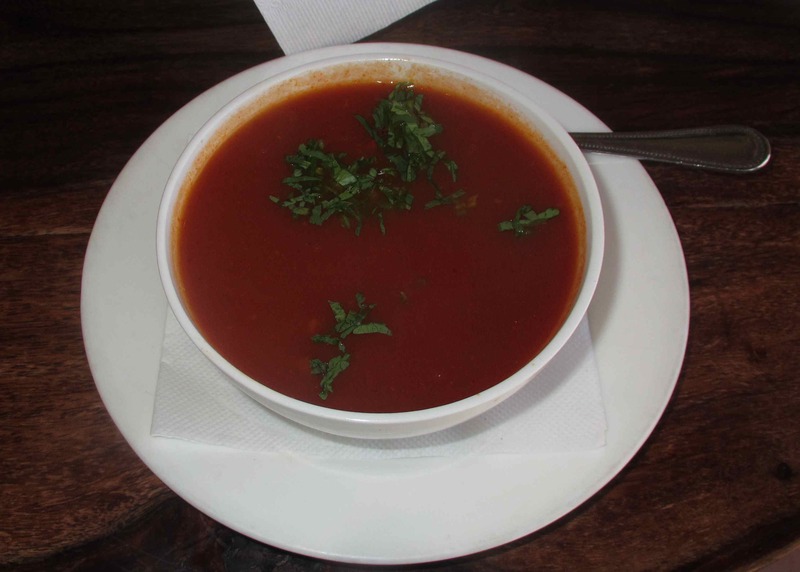 Roasted Tomato Soup – This sounded pretty interesting (being touted has having the ‘aroma of tandoor tomatoes’), but it turned out to be a bit disappointing. I really couldn’t detect any tandoor aroma particularly and the overall effect, other than the addition of a little coriander, was pretty much alike a standard tomato soup. It was well done, to be fair, but it definitely fell short of my expectations. Rating: 3 out of 5. 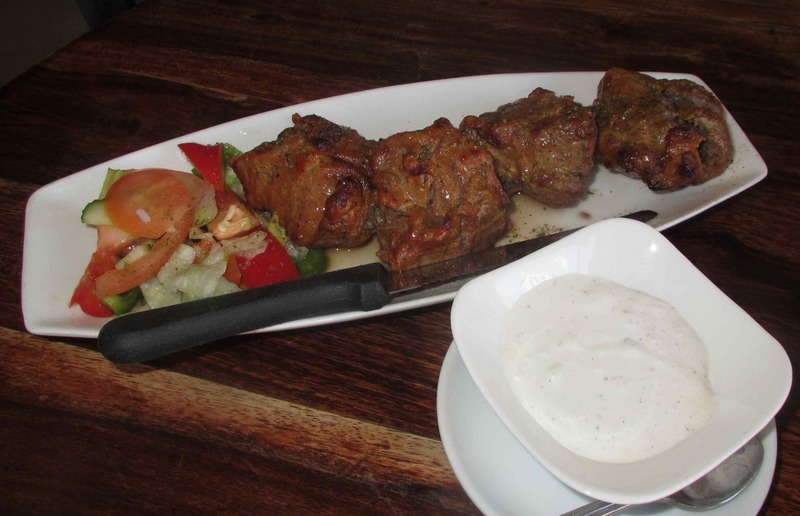 Boti Kebab – This dish consisted of skewered chunks of lamb that had been marinated in yoghurt and then seasoned with a Garam Masala. It was exceptionally well done – the ‘star of the show’, in fact – and I would have to say that this was probably one of the best lamb preparations I have had in an Indian restaurant. I love the rich complexity of most Indian dishes but I often find that both meat and vegetables are a bit ‘overcooked’ compared with other cuisines. Here, however, the generous chunks of meat were still slightly pink in the center and retained a good, firm texture. The seasoning was deftly handled, and the Cucumber Raita, which came on the side, was more enjoyable for me than I usually find it to be. In truth, though, this dish didn’t really need a ‘cool-down’ accompaniment and the Raita was thus a bit superfluous. Rating: 5 out of 5. 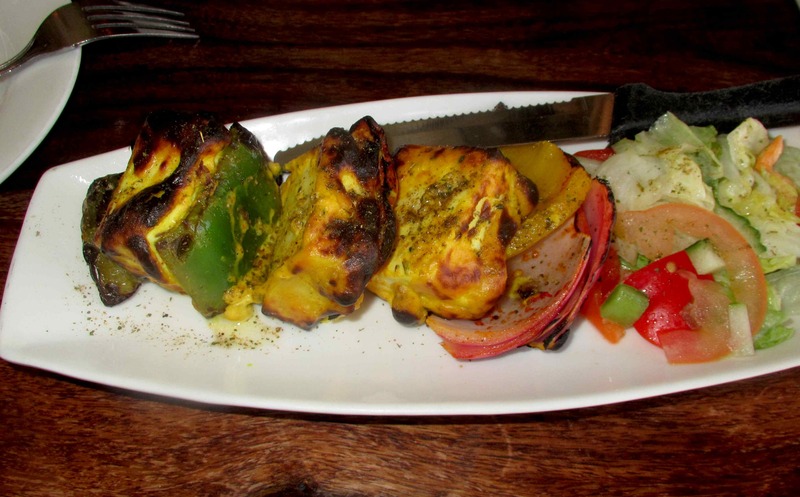 Achari Paneer Tikka – This was described on the menu as ‘pickled cottage cheese from tandoor’ and consisted of very large chunks of Paneer Cheese skewer-roasted between pieces of sweet pepper and onion. I was actually intrigued by this dish as it was ostensibly ‘pickled’ paneer (which I have not had before), but it turned out, a bit disappointingly, to taste no different from the regular article. 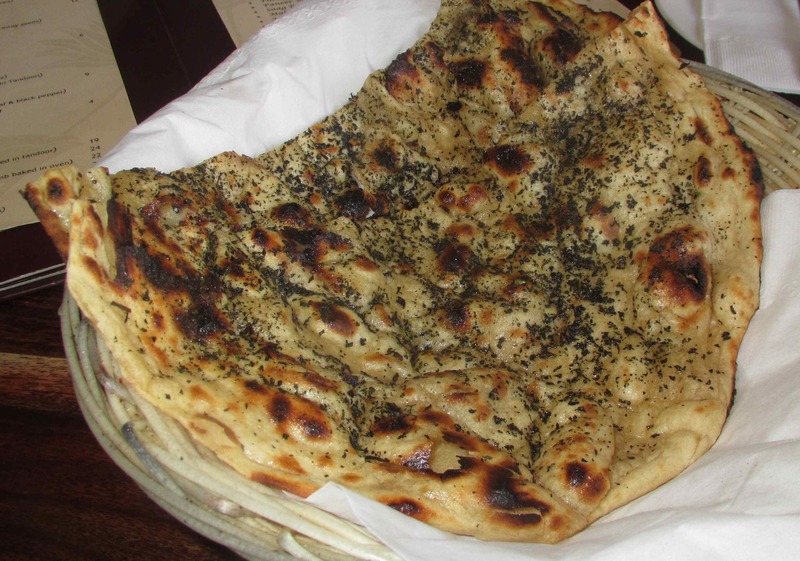 Still, it was very good and I loved how the charring from the tandoor added to the overall flavor. The seasoning could have been a little more assertive, but the dish was otherwise very enjoyable and I would like to replicate it at home sometime. Rating: 3 out of 5. 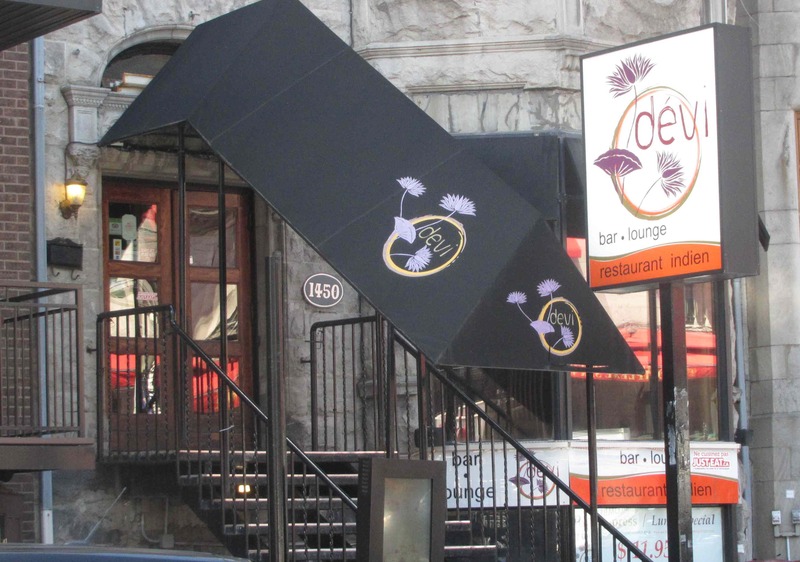 Devi is a very pleasant restaurant with decent service and interesting menu selections. I enjoyed my visit and would very much like to sample some of their other offerings in a future visit. Rating: 4 out of 5. I love how you just ate your way through appetizers! I have never seen soup at an Indian restaurant. I wonder why that is? Here in New Zealand, an Indian curry is huge. More than 1 person can eat, but we still order 1 each with rice and bread and have no room for anything else. Just eating appetizers for dinner would be a great way to tick off a few boxes and know what to focus on next time. I celebrated my 30th birthday last year at my favourite South Indian restaurant where I ordered 5 different curries to share between 13 people. The rest of the dinner was made up entirely of appetizers. That was my way of trying all the interesting appetisers without having to eat a whole plate of it in case it didn’t work out. Everyone enjoyed the dinner a lot and it was a great way to eat with my family who almost always eat Chinese together. My favourite Indian snack has got to be dahi puri. You should try it if you haven’t already! The Manchurian cauliflower is an Indian Chinese standard and they probably didn’t invent it. An interesting review, thanks!